years old. I was one of Dania's first friends when she moved here from California and every since, we have helped each other survive the trials of life and shared in each other's joyous moments as well. Her and her mother, Marilyn Murphy, have always been there for me when I needed them most. I was her Maid of Honor in her wedding in 1999. She now lives in Olathe with her husband, Mark, and two handsome little boys, Grant and Kyle. Tammi and I have also been friends since high school, when I was unofficially elected by her brothers and her parents to make sure she survived her youth. She was always the friend I could count on when I wanted to escape the trials of life and have fun (whether that was simply singing as loud as possible in the car or hitting the hotspots in town). We have been part of each other's support system and workout partner for years. She owns her own hair salon in Olathe and shares her home with her adorable son, Cody..
Logan is my sister Jody's daughter. I have always wanted Logan to be in my wedding some day. Now that she is thirteen and becoming a beautiful young lady, I thought she would be better suited as a junior-bridesmaid, rather than a flower girl. She is doing well and growing up way too fast for my liking. Thankfully, she is close to us, living in Olathe. so excited to have her walk the aisle just before me. Her 2 year old little sister, Greta, may or may not join her for the journey down the aisle. fellow friends, Mike Runyon and Bruce Coffman. Nicole, both of whom we love spending time with. Troy Miller and I went to Bishop Miege high school together for 4 years. We have withheld a tradition of getting together for 1 night every year (while Troy is home during Christmas) ever since we graduated high school together. Troy is one of the funniest guys I have known and enjoys performing in an improvisational comedy group where he currently lives, in Austin, TX. 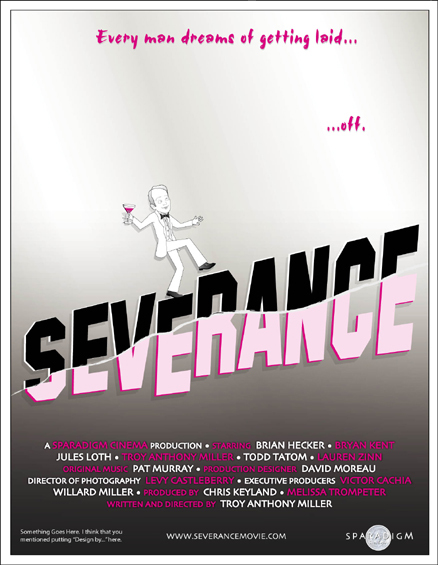 Troy recently finished writing, directing and starring in his first full-length independent film ("Severence"), for which I was honored to be asked to design the Poster/DVD cover. Anastasia, and their darling little girls, Lily and Greta. one of the funniest guys I've ever known, and is an extremely talented artist. Andy lives in San Francisco with his wife, Cassie, and their new daughter, Maddy!